IN Africa, at the end of the 19th Century, especially in West and Central Africa, a race was witnessed between the main colonial powers trying to sign as many treaties as possible with local chiefs, to hoodwink the indigenes and ensure the ‘legal’ yet deceitful underhand transfer of the lands into the hands of Europeans. These treaties were signed by African chiefs, usually at the advice of missionaries and hunter explorers who coerced them into the contract, knowing that they were ignorant of European laws and Charters, let alone the English language. The written settlements usually involved the notion of peaceful relationships while providing for the cession of land ownership from the indigenous communities. These notorious pieces of colonial legislation were used by the colonising powers as proof to ensure the transfer of sovereignty in their favour. A similar requirement of effective occupation was repeated in Article 10, in the 1919 Convention of Saint Germaine. In Rhodesia, in 1969, land segregation between indigenous people and the settlers was written into the new Constitution; giving legal status to Rhodesia as a ‘white man’s country’. The land was divided almost exactly between Africans and Europeans. However, almost five million indigenous people, theoretically 67,9 persons/square mile (2,59km2), shared the 44,94 million acres of land; while less than a quarter of a million Europeans, or 3,2 persons/square mile, shared 44,95 million acres of European land. These new arrangements increased the pre-1969 European share of land while cutting the overall amount of African land by reducing the African purchase area (APA), where the indigene could own land, and abolished and redistributed, strictly on racial lines, the unreserved land formerly open to all races. In 1904, the area of these reserves was 38 871 square miles, (100 677,89km2), the African population 268 618, or 6,8 persons/square mile. Yet, the Land Commission had set aside African reserves which were to be inalienable. Land policies prior to 1969 were intended to protect European vested interests. Yet the fact that Land Tenure Act was passed in 1969 and defended by the Rhodesia Front partly on the basis the Carter Report of 1925, clearly demonstrated the Land Tenure Act existed solely to protect white interests. The Native Commissioners who recommended that the reserves be created no doubt miscalculated the rapid increase in the indigenous population, from approximately 200 000 in 1890, which gave credence to the theory of ‘empty’ land, to a population over 4,5 million indigenous people in 1969. By 1925, before political criteria assumed a prominent role in land apportionment, ‘the lion’s share’ of the better parts of the country had been secured for Europeans. By the 1960s, it was evident that the division of land was unfair, outdated and unrealistic; it was retarding not only indigenous Africans, but national progress. According to the 1923 Constitution, alienation of reserved land required British consent. Outside the reserves, Africans, theoretically,had the right to hold land on the same terms as white settlers. Their lower economic position though, precluded this. By 1925, Europeans had bought 31 million acres while Africans only had 45 000 acres, despite their anxiety to increase their ancestral land holding. Yet the churches also owned vast tracts of land and were among those who dispossessed people of their ancestral land. The combination of arguments persuaded the British Government to allow the enactment of the Land Apportionment Act in 1930; appropriately regarded as the foundation stone of the ‘Rhodesian way of life’. Its retention was essential for the electoral success of the Rhodesian Front party in 1962; and was entrenched in the 1969 Constitution as the Land Tenure Act. In this, as with all other major decisions affecting them, indigenous views were chiefly ignored. The Land Apportionment Act did not initiate the division of land into ‘black and white’ areas; that came with the creation of the reserves. It, however, consolidated the division of land and imposed a fundamentally inferior status of ‘semi-citizens’ upon the indigenous people of Zimbabwe. Under the Land Apportionment Act, indigenous people were allocated a small part of the land; but only land in the purchase areas could be bought, which provided a few indigenous Africans with the only possibility of competing in the economy. Discrimination was not confined to the legal tenure of land. With no compromise on white supremacy and colonial economic interest, no matter the consequences in terms of human misery, the colonial authorities employed other subtle but inhumane methods to subdue, intimidate, disenfranchise, impoverish and control the colonised people. Coercing African men into migrant labour in neighbouring countries through the imposition of taxation — to force them to enter the money economy, to work in their homes, factories, farms and mines — resulted in the decline of indigenous agricultural production as the burden of family work such as ploughing fell mainly on women; the emergence of broken homes because husbands were absent from home for long periods of time; and the impoverishment, especially of those who could not find work and had to sell the few cattle they owned to meet their tax obligations. Yet, many indigenous people were not made aware of the fact that they had lost their ancestral land, or that they could be given compensation. In the rich agricultural lands in the mountains of Inyanga, 250 000 acres were ‘sold’ in 1905 without the knowledge of the inhabitants– the Tangwena people — by the BSAC to the Anglo-French Matabeleland Company. The latter ceded part of it to the Gaeresi Ranch Company. The Tangwena people were not made aware of this alienation until 1965 when the manager of the ranch decided in the interests of economic farming to extend his fencing to encompass them. Ranch, located in the remote Inyanga north lowveld area, on the Gaerezi River bordering Mozambique. Later, the area was particularly vulnerable as the war intensified, due to its location on the border with Mozambique, and was regularly subjected to various types of attacks from across the Gaerezi River. The white farmer needed to ‘rationalise’ by reducing the African population on Gaeresi Ranch and offered labour contracts to some of the Tangwena people; the remainder of the people were expected to move to whichever ‘reserve’ the District Commissioner of the area arranged for them. Faced with the eviction of over 250 families, the destruction of their houses and crops, Chief Rekayi and his people stood their ground and refused to move. While over time, many indigenous Africans protested at similar moves,none did so with such dignity and determination — making vigorous, legitimate protests to the authorities, going as far as to the Secretary for Internal Affairs — to no avail. Chief Tangwena was dismissed and given the standard treatment afforded to African chiefs who assert their people’s rights. However, undeterred, he and his people physically resisted eviction. They successfully challenged its legality in the law courts on the grounds that, under the Land Apportionment Act, “…natives who had lived upon Crown land before its alienation were protected ‘squatters’….” and could be removed only by a governmental decision in the form of a proclamation. Instead, the colonial Government followed the traditional racist way of dealings with African land. In 1969, they issued a proclamation ‘ordering’ the Tangwena people to vacate their traditional area. Legal action was followed by bulldozers and, eventually, by police, dogs and soldiers. The Tangwena people, however, maintained their stand and, when moved, returned to their land. 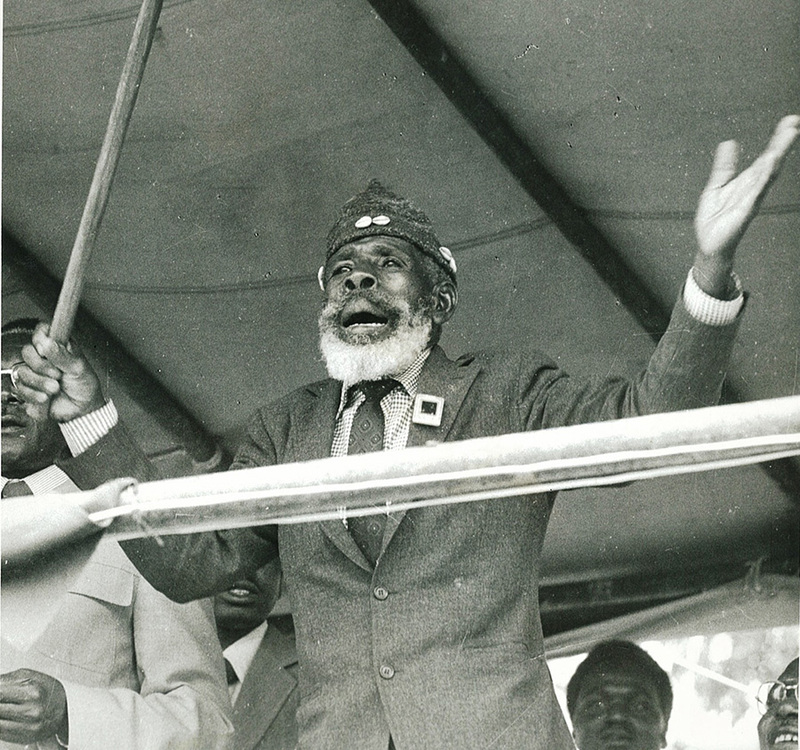 Chief Tangwena and his people continued to confront the authorities. The ‘unaccustomed degree of restraint’ may have been due to its awareness of world attention focused upon it, at a time when Rhodesian leaders were seeking a settlement with Britain and international recognition by the Western world. Or perhaps to a begrudging admiration of the overwhelming moral effect produced by this ‘African leader in rags’. Today, it is important that we recognise Mambo Tangwena as an iconic leader of African resistance in the annals of Zimbabwean history. On numerous occasions, indigenous people were removed in circumstances similar to those of the Tangwena people, such as when mining rights held by Europeans led to the displacement of many indigenous people, even in what were nominally their own areas. Apart from tenure and scale, Africans suffered other disadvantages; the main roads and railway lines were planned only in relation to white-occupied areas, thus strategically cutting off the indigene from the commercial network. The indigenous majority had been placed in an economically weak position from which it was virtually impossible to recover, unless fundamental changes were made. They were cut off from the economic power which went with land ownership. The ability to compete and achieve authority by other means had been further lessened by a deliberate policy of legally restricting opportunities for African education, training, enterprise and collective bargaining. Furthermore, urban centres, hence industry and associated activities, were concentrated in white areas. In relation to soil fertility and rainfall, the better agricultural land was predominantly in white areas. By and large, whites had almost as much good land as bad land; whereas African land was three-quarters bad and only a quarter good land. The minority pursued this policy not only because of a direct desire to ensure a quantity of semi-skilled labour, but also because of a real awareness that experience, self-confidence and self-respect in any field was inextricably linked to the danger of a concerted demand for political power by the Africans. There was a vicious circle in which white oppression of the indigenous African created a depressed condition among the majority of the people, which in turn, was used to justify their continued oppression. The spiritual depression, mental colonisation, mutual suspicion and apathy which resulted was not without their physiological effect upon the African people. The destruction of traditional structures, and their replacement by dependent and compliant institutions helped to ensure that African reaction to minority rule was slower and less vigorous than might be expected. This psychological paralysis was a deliberate ploy by the white minority to weaken African resolve and ensure continued white occupation and ownership of African land. The corollary of deliberately fostering African inferiority was the perpetuation of white superiority. How else can one explain the extraordinary fact that a handful of white foreign settlers with no knowledge of the land, ecology and people they colonised, could maintain control over five million indigenous Africans. It equally illustrates why the issues of self-respect, self-reliance of pre-occupation traditions was increasingly important to both the political and military resistance of the nationalist movements of the 1950s; the liberation war of the 1960s to 1979 and the land reform of 2000.